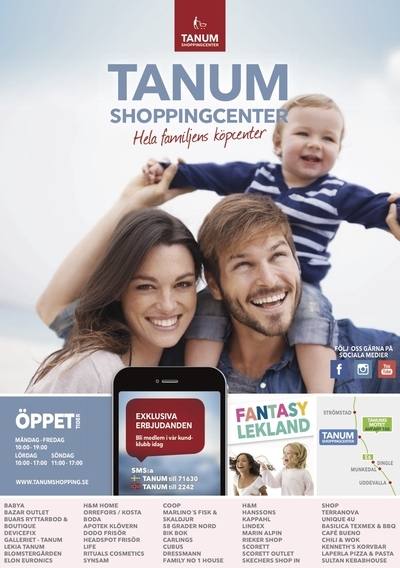 Every reason to visit Tanum Shopping Centre! Many shopping malls in Sweden and Norway often feels a bit complicated to visit. It can be both the size, the design of multi-storey parking facilities as well as the way to get there. Tanum Shopping Centre has been trying to take this to heart and created a state of the art center which is just easy to get to and find, by the side of the E6, midway between Oslo and Gothenburg. Tanum Shopping Centre has put a lot of effort and thought into its environment and shopping structure. We have a wide range of restaurants and cafés with delicisous tastes from all corners of the world. All located in a pleasant and relaxed setting with close proximity to both the shops and other amenities. You will find a wide selection of shops ranging from food & dairy products, fashion & footwear, consumer electronics, decoration, beauty, body care, candy, sports & leisure. In addition to the large and well-known high street retailers, there are several new and exciting concept that you only find in Tanum Shopping Centre. One of Sweden's best and and most price competitive Coop stores of about 4,000 m² with a stated green profile. Here you will also find fresh fish and quality meat from Kustcharken in Askum. To further strengthen our green profile we have a large number of charging stations for electric vehicles of all models, Tesla destination chargers, free RV parking with electricity and LPG dispenser. The entire center is running on green electricity. Tanum Shopping Centre is in the heart of northern Bohuslän and only 10 minutes from the world's most beautiful archipelago. There you will find Fjallbacka, where the Hollywood star Ingrid Bergman spent many of her summers., Now the resort is the central scene in Camilla Läckberg's world famous novels. 15 km north of Fjällbacka you will find Grebbestad with it´s restaurants, campsites and pedestrian piers. Here you can enjoy the tasty Swedish oysters straight from the sea. Another 5 minutes away you will find Vitlycke Museum and its rock carvings, several years on the UNESCO World Heritage List. Just north of Tanumshede you can also visit the Koster Sea National Park, Sweden's westernmost point, a fantastic island world that has the most to offer. In addition to this, only a few steps away, are the highly recognised Mjölkeröd and Fjällbacka golf clubs. Tanum Shopping Centre is located only 30 minutes from the Norwegian border, 1 ½ hour from the Norwegian capital, 1 ½ hour to Gothenburg and only 4 ½ hour of motorway to Copenhagen and the continent.